If you have ever read any of my thoughts on films involving space exploration, you probably know what I am about to say. Here it goes: I love science fiction cinema and the way it can seemingly sweep me away from my seat and take me to worlds I otherwise would never see. So yeah, I'm probably a broken record when I review movies like The Martian. Does this mean I am predictable? The reason I am predictable is because I am just being honest and I have no other or better way to express the way I feel when I witness the beauty of science fiction done right. I live my life in a very safe fashion, moving from point A to point B and back again with little room for discovery or excitement. I know that sounds like I am complaining, like I am itching to burst the bubble of routine and leave the norm behind for new experiences, but honestly I'm not. I don't want that bubble to burst. I love normalcy. I'm not looking for new. That's where cinema comes in. I want nothing more than to stay grounded and yet I am fascinated by the grand vastness of space. I look up at the stars and wonder just how far one would have to go to see it all. Perhaps there isn't even an "all" to see. Perhaps the journey is never-ending. Whether blatantly fictional or at least presenting a story that could conceivably be based on fact, Ridley Scott has taken me to places I could only have hoped to dream of without the magic of cinematic storytelling and I am forever grateful. The Nostromo and the horrors taking place inside it. In space, no one can hear you scream. A mission to meet our maker and discover the origins of humanity in Prometheus. Now, in comparison, a relatively short trip to Mars, the crew of the Ares 3 forced to cut their time away short as they evacuate due to a powerful storm. Not every member makes it back alive. Mark Watney has died. The Martian, based on the remarkably entertaining novel of the same name by Andy Weir, absolutely nails the tone of its source material as the screenplay by Drew Goddard, the performances by the outstanding ensemble and the direction by Scott work together perfectly to present the type of picture that serves as a reminder of why I and so many other people love movies. Two hours and twenty some minutes of smart, stylish fun featuring multiple moments that are so clever it is impossible not to laugh aloud but then before you know it, a tear may well in your eye thanks to real and raw emotion. This is a movie with Oscar written all over it and I expect to see Matt Damon in the lead actor race when all is said and done. So funny and heartfelt, a man trying to stay optimistic and find the humor in a situation seemingly devoid of hope. The story of Mark Watney is fascinating and inspiring, and for over 140 minutes my eyes were glued to the screen and I can't recall a single moment that I didn't find compelling, and the fact that I had already read the book and knew exactly what was coming at every turn makes this an even bigger compliment. A brilliant adaptation that I can and will watch again and again. 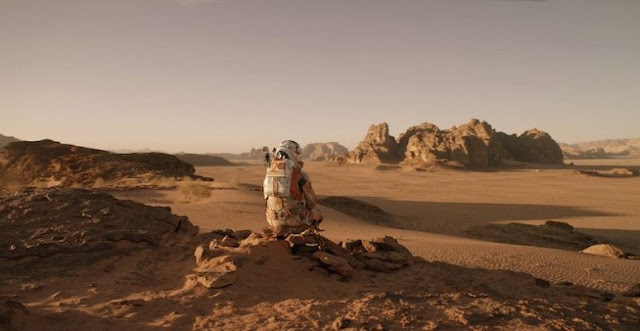 One scene in particular in The Martian caught my eye and made me smile, and I would imagine for a majority of others it was a forgettable blip rather than a favorite moment. 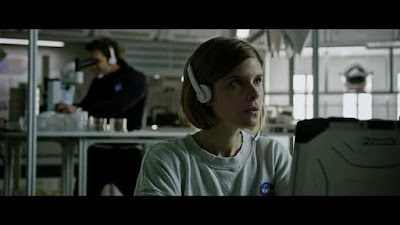 Beth Johanssen, played by the beautiful and talented Kate Mara, is running on a treadmill while aboard their spacecraft and the ominous backdrop of infinite darkness is right outside the windows. It was such a gorgeous and unique shot, watching someone run while the room they are doing so in spins through space. I don't know why but I can't get that very brief and seemingly unimportant moment out of my mind. I don't envy those who get to go up there and actually experience it. Just the thought of it is terrifying, but hot damn am I thrilled I got to see it on the big screen. If you haven't yet, do so. Gave your review a read Cody, terrific stuff. Looks like we are very much on the same page here. The balance here is what makes The Martian such a success, that it managed to dabble in the dark and brooding moments (hard to not associate those words with the storm on Mars and the "death" of Watney) but remain such an optimistic and hopeful and funny film throughout as well. Glad you loved it, and thanks for sharing your review. Excellent work, appreciate it. Was "The Martian" worth my time to view it? Yes. Was "The Martian" worth the price of admission? Yes. 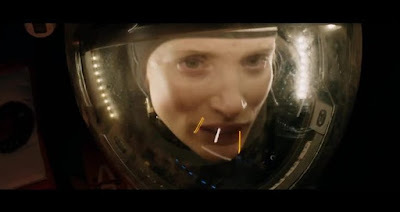 Did "The Martian" make me do a happy-happy joy-joy dance of amazement? I have to say "NO". Having read the book a couple of years ago, I found the movie to be flat and silent. The book is constantly in Watney's head. We're given a never-ending buffet of the science-engineering-macgyvering needed to survive on Mars. To achieve a fraction of that, the movie should have done some sort of narration voice-over. A handful of video diary entries just didn't cut it. To me, the movie felt like a precis of a synopsis of a summary. Watney's survival felt like an endurance marathon rather than a walk on a tightrope over Valles Marineris in the dark. The movie did succeed over the book with off-Mars events. People and events away from Mars in the book were two-dimensional (to be kind). The movie brought those people and situations to life. And only in Hollywood costumes and set decorations would an astronaut have an orange environment suit on the red-umber-orange surface of Mars. Style over safety! Feel free to poop on the party Big Murr, haha. I don't mind at all. It's funny, I actually not only disagree on the need for voice-over narration, I specifically thought of it during the film, that I am glad it didn't go that route. Him only talking to the cameras and nothing else made it feel a bit more authentic, where as obviously the book needs that because of the lack of visual aids to carry the story. Sorry to hear we didn't have quite the same enthusiasm here, but I'm glad you still enjoyed it overall. Thanks for your thoughts!